"Where on this weather map do you expect it's going to rain today?" Dr. Perry Samson asks the 200 students in his introductory class on extreme weather. Almost instantly, dots begin to appear on the displayed map, as students indicate their answers through their wireless laptops. In moments, a clear pattern emerges on the classroom display as Samson continues the lecture. While the debate about notebook computers in the classroom continues--do they add or detract?--Samson, a professor of atmospheric, oceanic, and space sciences at the University of Michigan, embraces computers in class. In fact, he has created an open source software tool that builds on the idea of classroom response devices but goes far beyond them, allowing students to use their laptop computers, rather than clickers, to answer a wide range and type of poll questions. The software also allows students to ask questions and share responses with the class, take interactive quizzes, and mark up PowerPoint slides. LectureTools has created "a more integrated learning environment," Samson said, noting that his teaching style has changed since he began using the software. "It allows me to do more interactive things; it's made my classes more engaging." 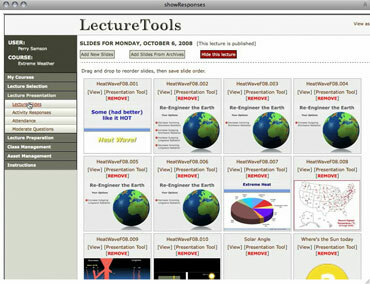 Samson created the software, LectureTools, based on his sense of the need for better ways to engage students in large introductory lecture classes. He has steadily added to the product over the last several years, incorporating ample feedback and ideas from faculty and students. LectureTools is now used by about eight professors and some 2,500 students at the University of Michigan and is poised to shoot up in use as word spreads, Samson said. He has informally offered the program to other schools and is in the process of instigating a more structured process of making it available. Using Web-based LectureTools in a wired or wireless environment, students can type in questions anonymously during class that appear immediately on the classroom display. In Samson's class, a teaching assistant responds with written answers on display as the lecture continues. When he began using LectureTools, Samson said, the number of student questions shot up to fully two-thirds of the class, a participation level unheard of previously. Using the software, students can also take notes synchronized to lecture slides, draw on and save the instructor's slides, and as with clickers, can take quizzes or anonymously respond to class polls that help Samson gauge what they understand. Students aren't required to bring a laptop to class, Samson said; they are given credit for participating in class, which he tracks using LectureTools, but can also obtain that credit by submitting answers on paper to him after class. In reality, nearly all students in his classes choose to participate via laptop. Samson, an award-winning professor who co-founded The Weather Underground Web site with student and Ph.D. candidate Jeff Masters in 1995, is associate chair and Arthur F. Thurnau Professor in the department of Atmospheric, Oceanic and Space Sciences at the university. He began developing LectureTools more than four years ago with colleague Ben van der Pluijm, as they saw more and more students show up in class with Internet-enabled devices and after trying out clickers. They seemed an excellent idea, Samson thought, but they were clearly limited, especially for science-based classes. Samson wanted to ask students questions beyond the standard true/false or multiple choice formats--questions incorporating maps or other images, for example, or asking students to rearrange a list. Developing and enhancing LectureTools has largely been a research project until now, Samson said, emphasizing that he has drawn on the work of many others as the product has evolved. "We want this to grow based on input and ideas from other students and instructors," he stressed. "It's a solution, not the solution. Think of it as a collaborative effort among instructors, for a tool that can be used in the classroom to deliberately engage students." In keeping with the organic model, Samson has encouraged others to build applications that add to LectureTools' functionality. A freshman last semester wrote a seating chart program for LectureTools that allows students to connect with others in large classes, via their seat in class, who might live in the same dorm or share similar interests. Other software in the education market offers some of the capabilities of Samson's, though few or none offer them all. One clear advantage to his solution, Samson said, is that he developed it from the ground up, in close consult with users. "One thing we like about this [solution] is, it's truly organic, based on input from faculty and students," he said. Beginning last semester, Samson now broadcasts his lectures live online through a product called Wirecast, from Telestream. Up to a quarter of students commonly watch his lectures in real time--and interact with him and the rest of the class through LectureTools. The Webcast, which allows Samson to teach while traveling, is also saved for podcasting later.